After enduring the bad weather and the swells rolling relentlessly through the anchorage, we regretfully slipped away from Statia and cruised over to Basseterre, St. Kitt’s. We all needed a respite from the lurching and rolling, so we were more then happy to take a slip at the Port Zante Marina. We were delighted with a starboard side-to slip, inside the marina away from all the swells. Ah…! Predominantly British since the 1700s, we saw numerous old stone churches -- Anglican, Roman Catholic, Moravian, among others -- many still in use, before stopping at Romney Manor and walking about its beautifully landscaped botanical gardens. Romney Manor was part of the larger Wingfield Estate, which belonged to Thomas Jefferson’s family, prior to being sold to the Earl of Romney. As we walked about the beautiful gardens, Lorenzo showed us the Roucou plant, or the “lipstick tree”, which fuzzy, flowering pods contain little bright red seeds that were used by the Indians for pigment. Or lipstick, as Lorenzo demonstrated, by putting it on his lips and posing! The seeds, when popped, spilled out a waxy red substance very reminiscent of lipstick indeed! It washed off with a little water and elbow grease. Fun! 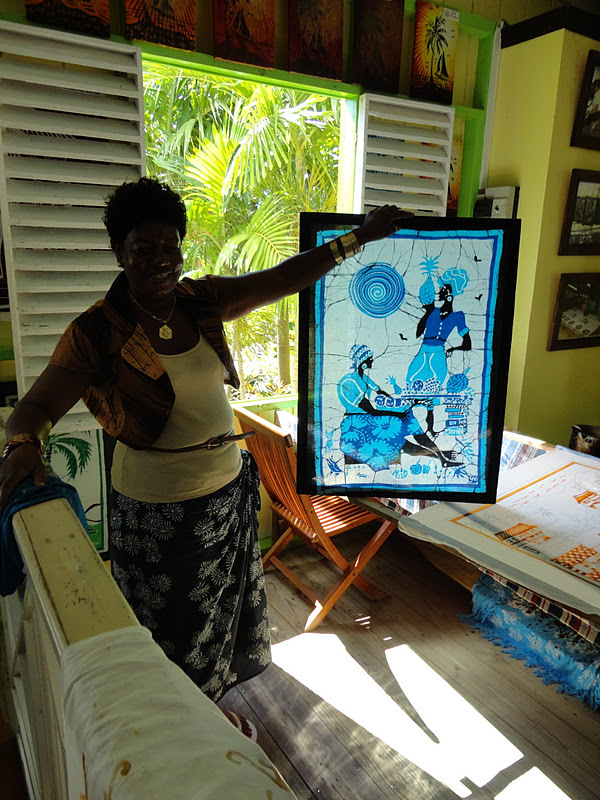 The manor is home to Caribelle Batik, and their workshop is filled with an array of works of art, beautiful to behold. It was fascinating to watch the women apply the wax, demonstrating how batik is traditionally done, and before showing different pieces in various stages of completion. We had a great time checking out all the intensely colored fabrics and items for sale; so many to choose from! 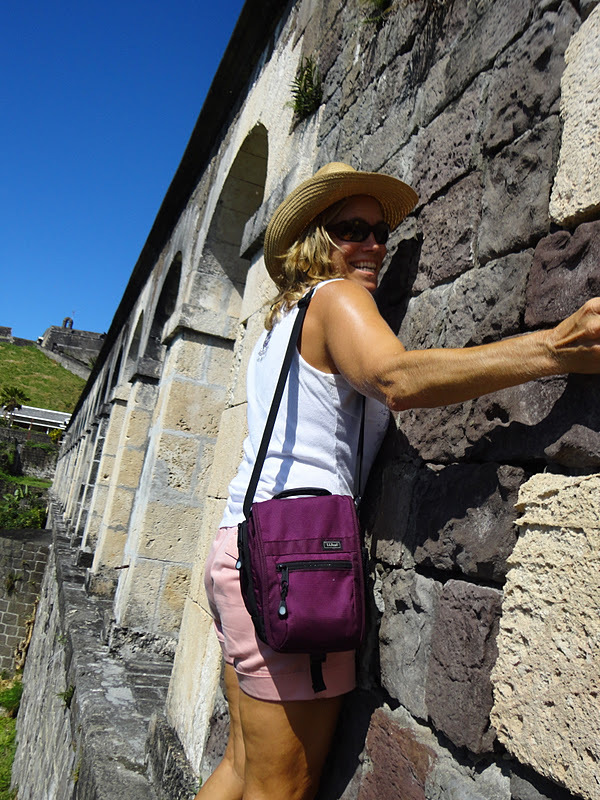 The remainder of the day, we spent scrambling about the Brimstone Hill Fortress on the west side of St. Kitt’s. The fortress, known as the “Gibraltar of the West Indies” is a UNESCO world heritage site, and impressively restored. (Check it out online for yourself at www.brimstonehillfortress.org !) We all had been there before -- Ron and I most recently in the spring -- but again, it was fun to explore and rediscover. From the eastern Place of Arms to the uppermost gun deck, we toured the exhibits and learned more about this significant piece of history. The place is wide open for exploration, with lots of areas accessible -- and some not so accessible -- but impressive as can be and we really enjoyed ourselves, climbing about! A great time was enjoyed by all! And they had these two rooms side-by-side?? Some places weren't as accessible...! Thanks for sharing your pictures. Indeed those are beautiful ruins and a historical place too. Ten Reasons We Love Anguilla!